SINGAPORE COMICS & COLLECTIBLES: GREEN LANTERN: NEW GUARDIANS #20 (2013) "Wrath of the First Lantern" Epilogue! GREEN LANTERN: NEW GUARDIANS #20 (2013) "Wrath of the First Lantern" Epilogue! • PLOT SUMMARY: Cover by Aaron Kuder Wrath of the First Lantern: Epilogue! - (W) Antony Bedard (A) Andres Guinaldo WRATH OF THE FIRST LANTERN' epilogue! 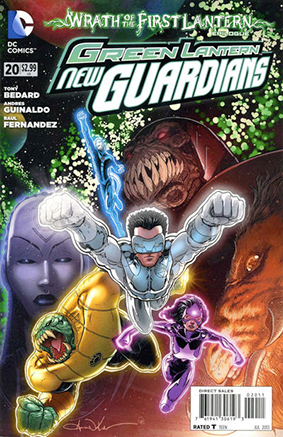 As a White Lantern, Kyle played a crucial role in the battle against the First Lantern and the Guardians. But a loss they suffered in the battle has left Kyle devastated, throwing off the control he had over the entire emotional spectrum. Has his time as a White Lantern ended before it's truly begun? Find out in the conclusion of Tony Bedard's run!